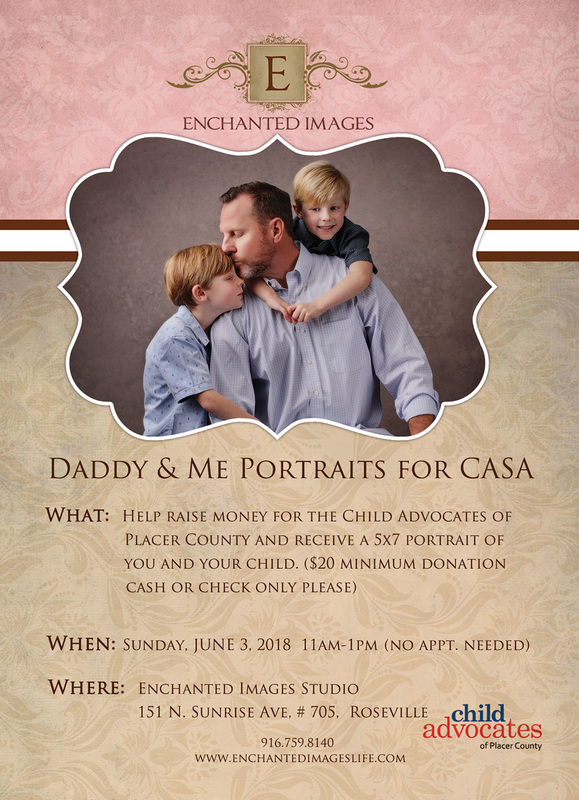 We’re bringing our Daddy & Me charity portrait event back, as many of you have asked! Just like our recent Mommy & Me event, these portraits will be photographed on the neutral background shown below, so your clothing options are endless! We have chosen one of our favorite local charity organizations, Child Advocates of Placer County (CASA) as the beneficiary of donations for this event, so please come out and help support the worthy cause! Donations will be accepted via cash or check on the day of the event. Remember, this event isn’t just for dads with younger kids–dads, kids, and grandpas of all ages are welcome, and this is a great opportunity for a multi-generational portrait! (you may have various groupings–$20 donation per grouping/5×7). Prints will be available for pickup on `Friday, June 15 and Saturday, June 16 from 11am-12pm, just in time for Father’s Day!